Legends of Hockey - Induction Showcase - Peter Karmanos Jr.
Karmanos cofounded the Detroit Compuware Youth Hockey Program in the late 1970's. 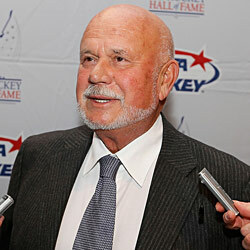 Peter Karmanos Jr. was born on March 11, 1943. While he didn't learn to speak English until he was in grade school, he certainly made up for lost time. The family moved to the Detroit area, and Peter immersed himself into local sports. After graduating from Wayne State University, in 1973, Karmanos and two partners pooled their tax return money to start a software company they named Compuware. Today, Compuware boasts 4,500 employees and revenues that exceed $1 billion. Karmanos' business prowess was recognized by the Institute of American Entrepreneurs, which named him 1989's Entrepreneur of the Year. 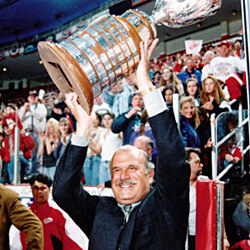 Karmanos won the Lester Patrick Trophy for outstanding service to hockey in the USA in 1998. 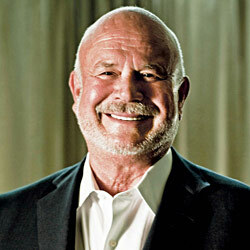 With one of his partners, Karmanos created the Detroit Compuware Hockey organization in the latter part of that decade. The organization includes tiers from Junior 'A' all the way through to recreational hockey. Among those who have been spawned from the Compuware youth hockey programs are Pat LaFontaine, Mike Modano, Eric Lindros and Kevin Hatcher. Karmanos won the Ontario Hockey League championship with the Detroit Junior Red Wings in 1995. In December 1989, the Ontario Hockey League awarded an expansion franchise to a team led by Karmanos, and the Detroit Compuware Ambassadors were born. This was the first team in the OHL to be located outside the borders of Ontario. The name of the team has evolved from the Ambassadors to the Detroit Junior Red Wings to the Detroit Whalers and is now known as the Plymouth Whalers. Karmanos was inducted into the Michigan Sports Hall of Fame in 2010. Karmanos purchased the Hartford Whalers franchise of the National Hockey League in 1994, and at the time, committed to keeping the team in Hartford for at least four years. But Hartford was the smallest American market in the NHL. And was compromised further by being located on the traditional dividing line between the New York Rangers, New York Islanders and Boston Bruins. In addition, the Hartford Civic Center was the smallest arena in the league, seating just over 15,000 people for hockey. The franchise struggled to attract enough season ticket holders, and announced that the team would leave Hartford unless they could sell 11,000 season tickets for the 1996-97 season. When that plateau was not reached, the team moved to Raleigh, North Carolina prior to the 1997-98 season, and was re-christened as the Carolina Hurricanes. The Hurricanes reached the Stanley Cup Final in 2002, facing the Detroit Red Wings, but lost that series in five games. Unfortunately, the momentum didn't last, and the Hurricanes fell out of playoff contention the next two seasons. If there was a positive note, it was the losing seasons allowed Carolina to draft Eric Staal in 2003. With Staal starring for the Hurricanes, the team had a 112-point season in 2005-06. They went to the Stanley Cup final once again, defeating the Edmonton Oilers in seven games to claim the first Stanley Cup championship in the franchise's history. In 1998, Karmanos formed Gale Force Holdings to manage his hockey interests, which include the Carolina Hurricanes and PNC Arena, the Florida Everblades of the East Coast Hockey League and Germain Arena in Fort Myers, Florida, the Plymouth Whalers of the OHL and Compuware Arena. In 2011, a new subsidiary of Gale Force Holdings, LP, was created called Hurricanes Holdings, LLC, which features the Hurricanes and the management of PNC Arena. 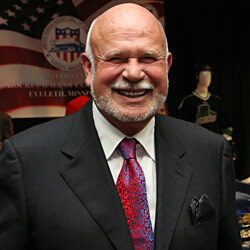 Peter Karmanos Jr. was awarded the Lester Patrick Trophy for outstanding service to hockey in the United States after the 1997-98 season. In 2010, he received the OHL's Bill Long Award in recognition for his outstanding contributions to the league. That same year, he was inducted into the Michigan Sports Hall of Fame. In addition to his business and hockey interests, Karmanos is widely known for his philanthropy, particularly in the area of cancer research.